Reading Aaron Marcus' interview in Letraset The DIY Typography Revolution reminded me that a while back I took a few pictures of his work when on a visit to the Letterform Archive. 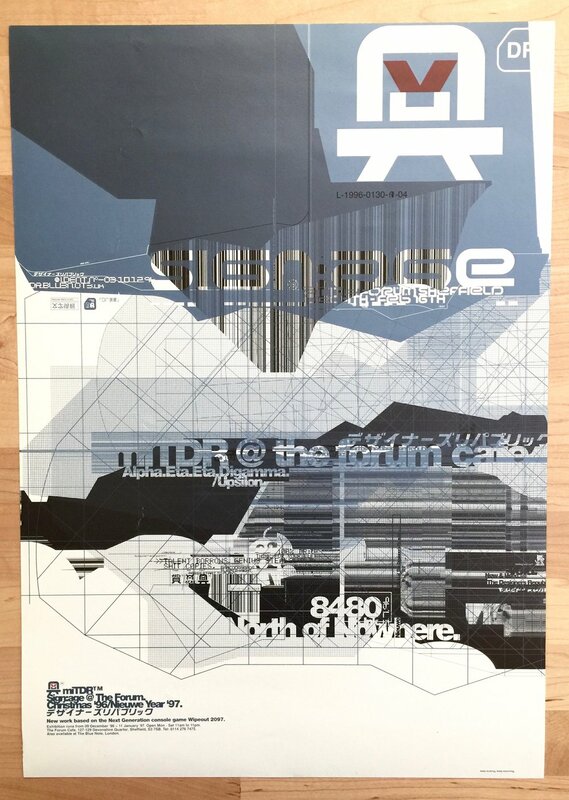 They have a large amount of his work, which includes plenty of his Letraset based compositions. 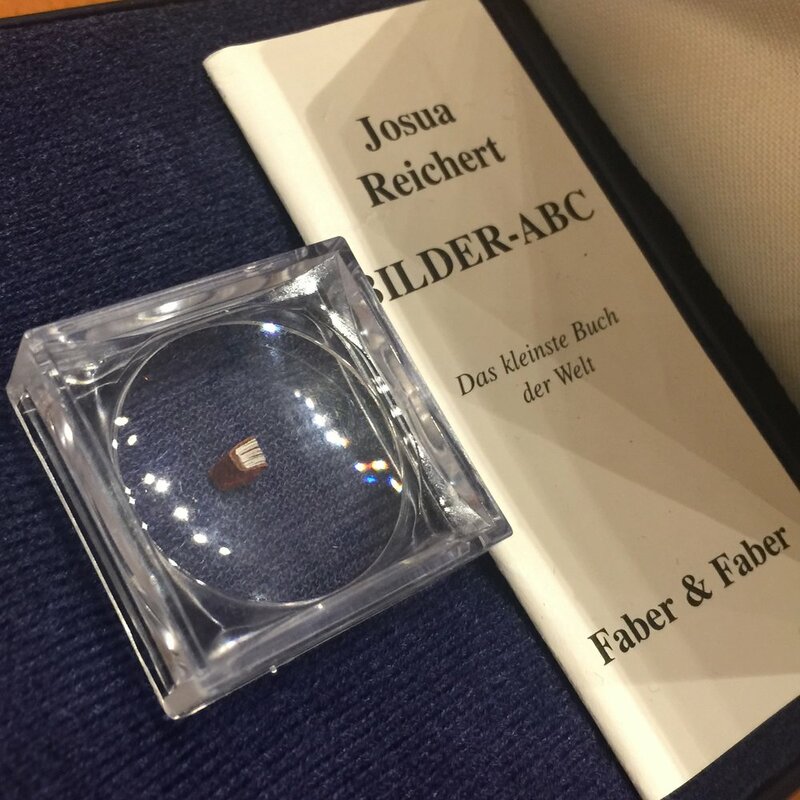 Also he recently gave them his complete reference library, which is a fabulous insight into the ideas behind his creative process. 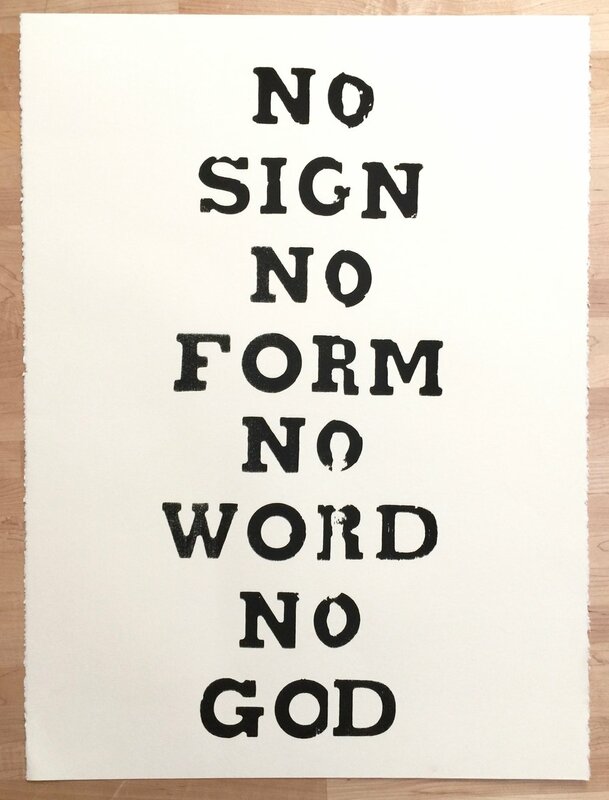 If you join the Letterform Archive you can get access to beautifully shot (much better than my iphone pics) high res versions of this work and a tonne of other amazing pieces by him and 1000s more items. 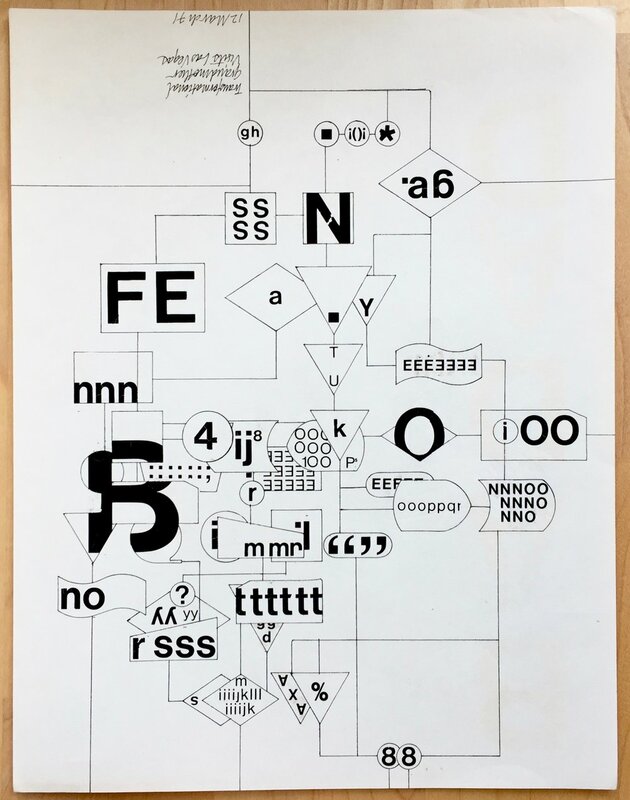 Whether you call them art, concrete poetry or typographic experiment I can't help but love these compositions. The energy and flow of them is outstanding - totally my bag. Now one of the trickiest things about these pieces is working out which way up they go. So apologies if some of the above are wrong. 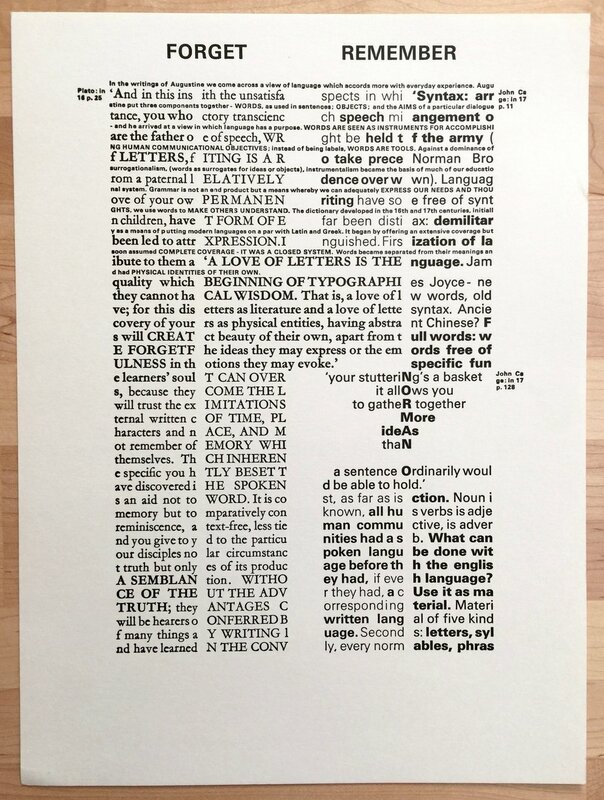 If you're looking for a little information and even to get hold of some nicely shot high-res images of his work, then check out this piece on Letterform Archive. 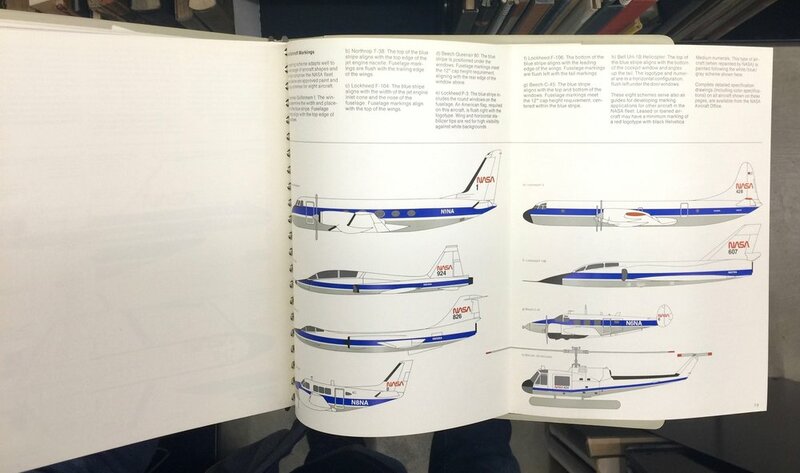 On my last visit to the Letterform Archive I got to have a look at some of the Braun design guidelines. 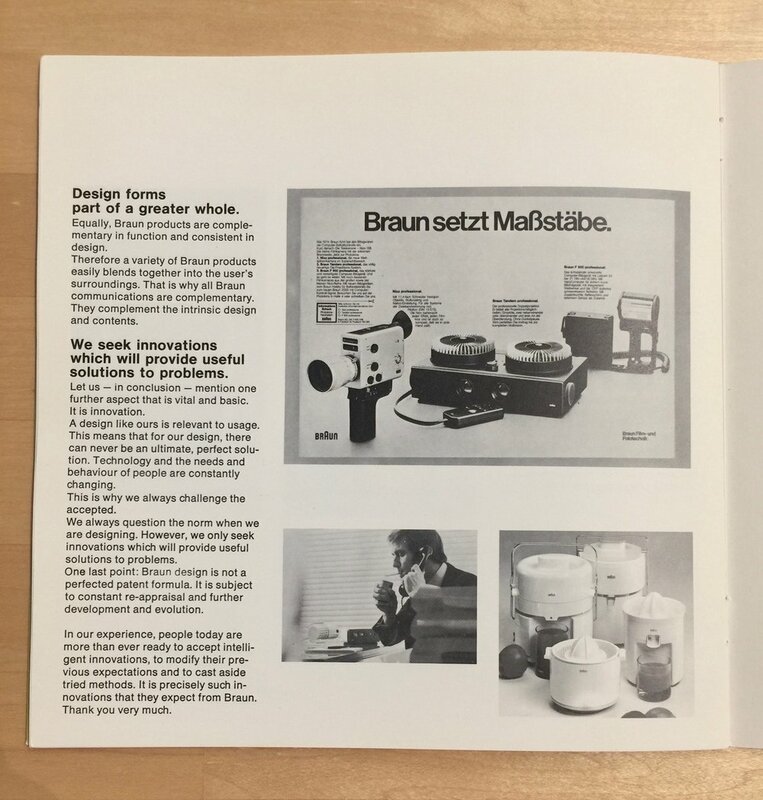 These aren’t the Dieter Rams principles for good design, they are the translation of the Braun design philosophy into a set of brand guidelines. 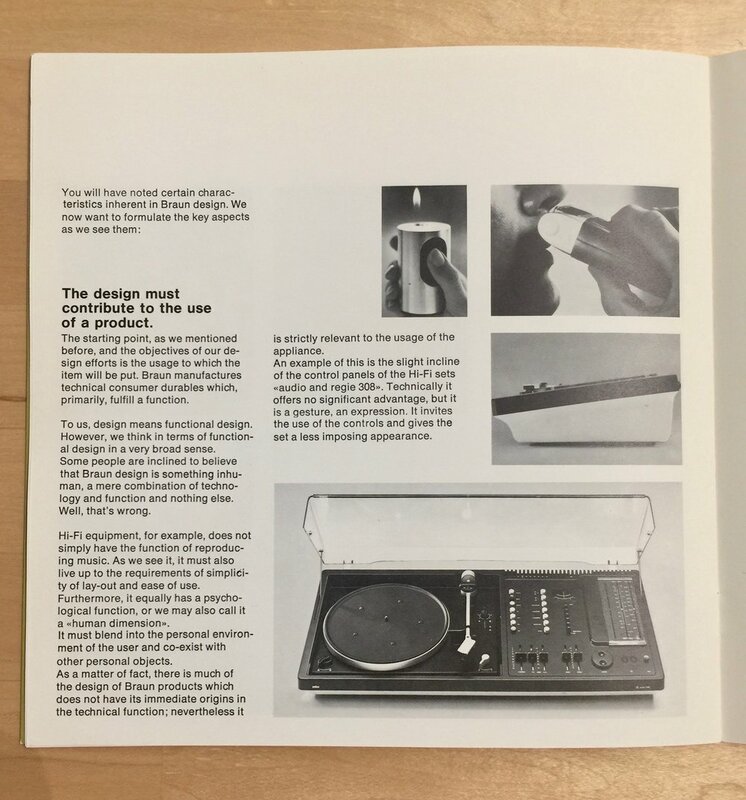 I do admire Dieter Rams and his work but I’m in no way part of the whole “Dieter Rams design cult” that seems to have sprung up over the few years in the UI/UX space, for me there's more to design than minimalism. 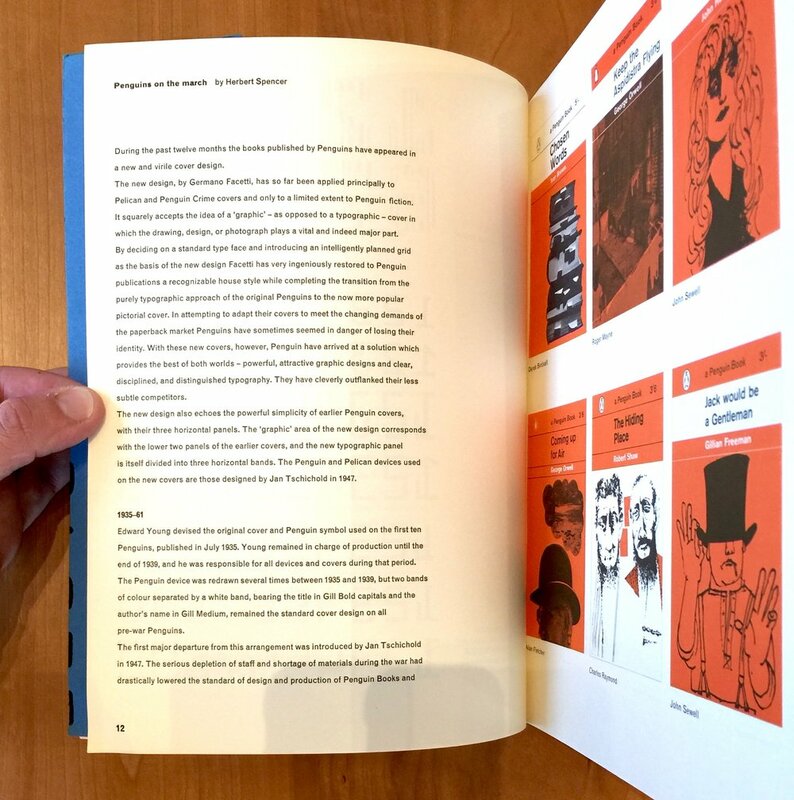 However the guidelines have four parts and The Realization of a Corporate Concept part is chocked full of great design insight - a wonderful translation of product design into practice and on into brand. Braun design is teamwork - I love this, so often we focus on the individual, but at the end of the day design is always a collaboration. It takes a lot more than 1 person to bring a product to life. Design is not an applied technique of embellishment - damn right! Design is core to the essence of a thing; how it works, the intension of use, the expereince of the thing. Design is not a transforming mask, nor an added after-thought - hence; "you can't put lipstick on a pig", "you can't polish a turd" ("but you can role it in glitter" as an old colleague of mine used to say). The design must contribute to the use of a product and Design forms part of a greater whole - it must always be meaningful, it must support the overall purpose. 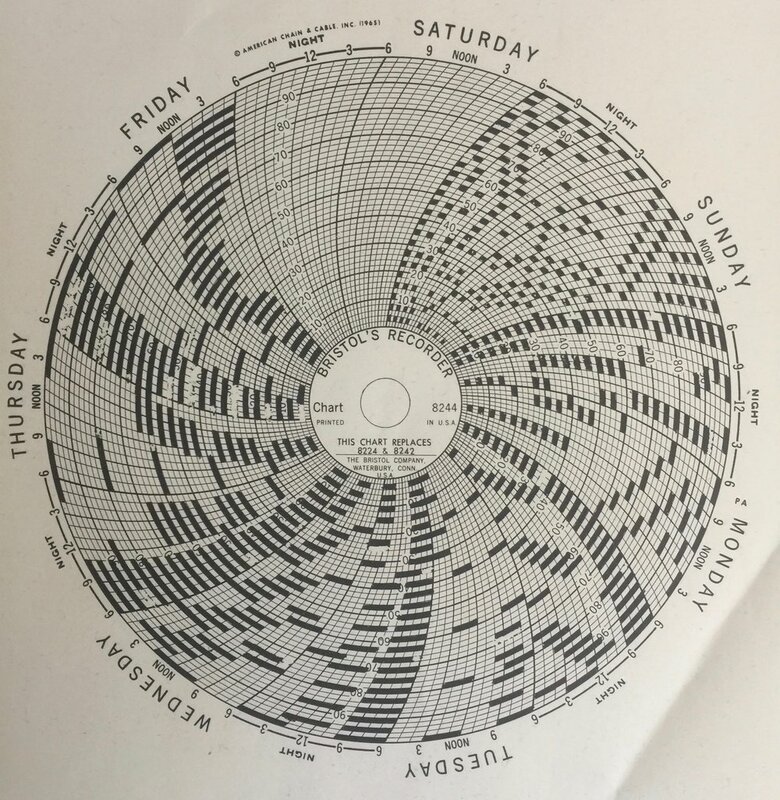 Consistency is an expression of our design philosophy - this hits home for me, it creates that underlying almost invisible sense of belonging and being part of the same family, so key for any organisation. 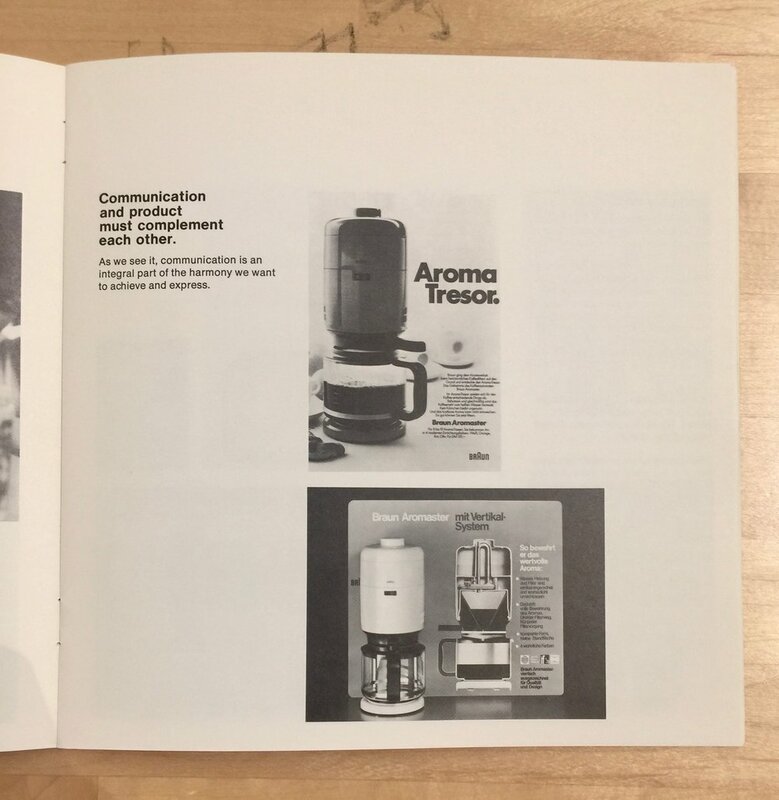 Communication and product must compliment each other - often there's tension between product and marcomms teams, but everything must feel part of the same overall aesthetic/ideals or there's an unsatisfying shock when someone experiences one then the other, mismatched marcomms can make a customer feel duped. 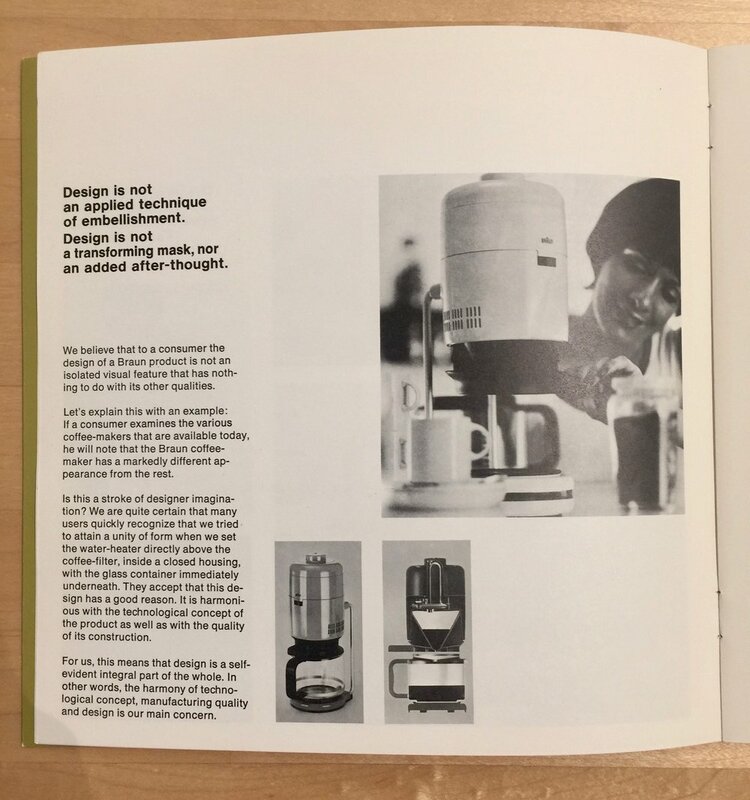 For us, good design means as little design as possible - not so sure about this, I'd say that the impression of 'little design' is still a lot of design work - at least in the technology field. Our design is orderly - I love this as it seems to cut straight to the cultural heart of the brand. 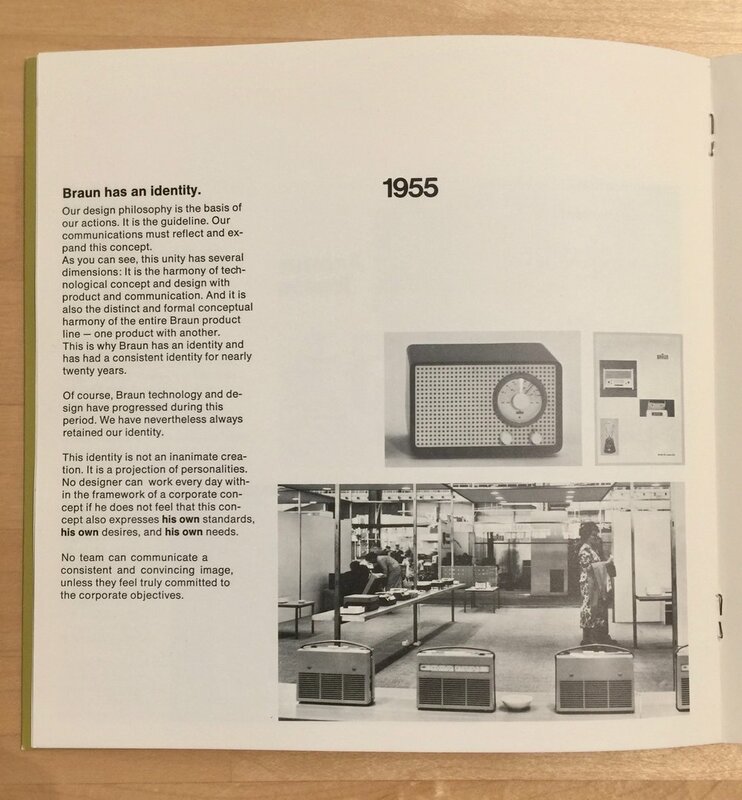 Whatever you feel about Braun and the elegance/tyranny (delete as necessary) of the modernist Northern European design aesthetic, these guidelines offer some great advice for product/brand teams and how they can come together. 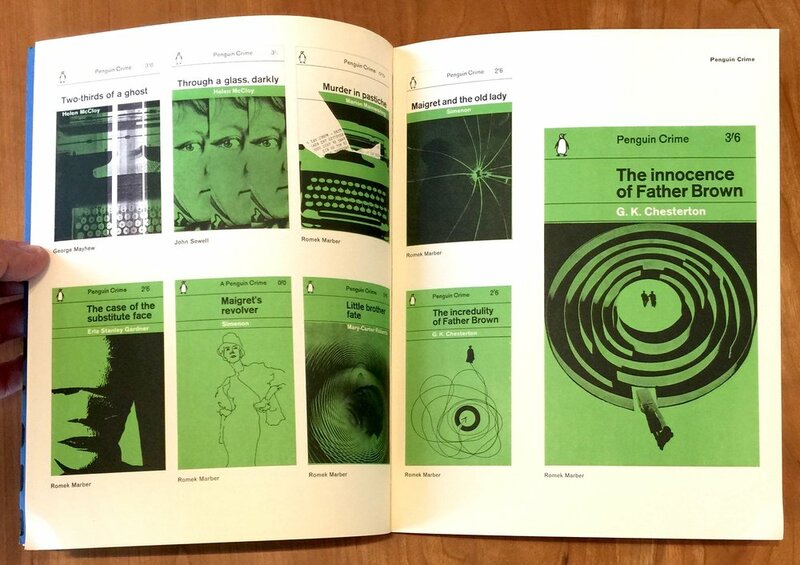 Also take a look at Dieter Ram's now infamous Ten Principles for Good Design. 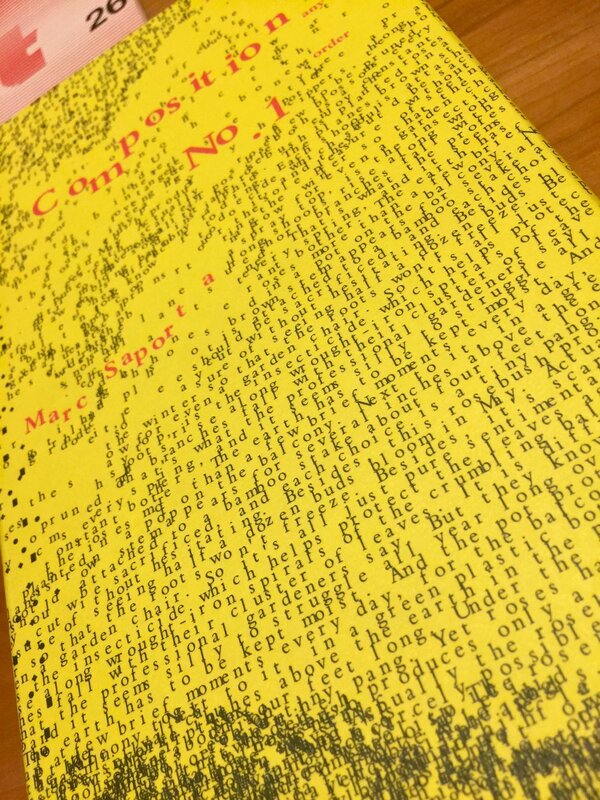 I'm often visiting the Letterform Archive just after they've put on a visit for this or that design team or artist or historian. So I get to see the 'table' that's been put together for them. Sometimes these reflect specific themes or ideas the visitor has requested other times it's more of a 'greatest hits' or simply reflects what the person running the session loves the most. Last time I was there, the table was a particularly eclectic and fascinating collection of items. 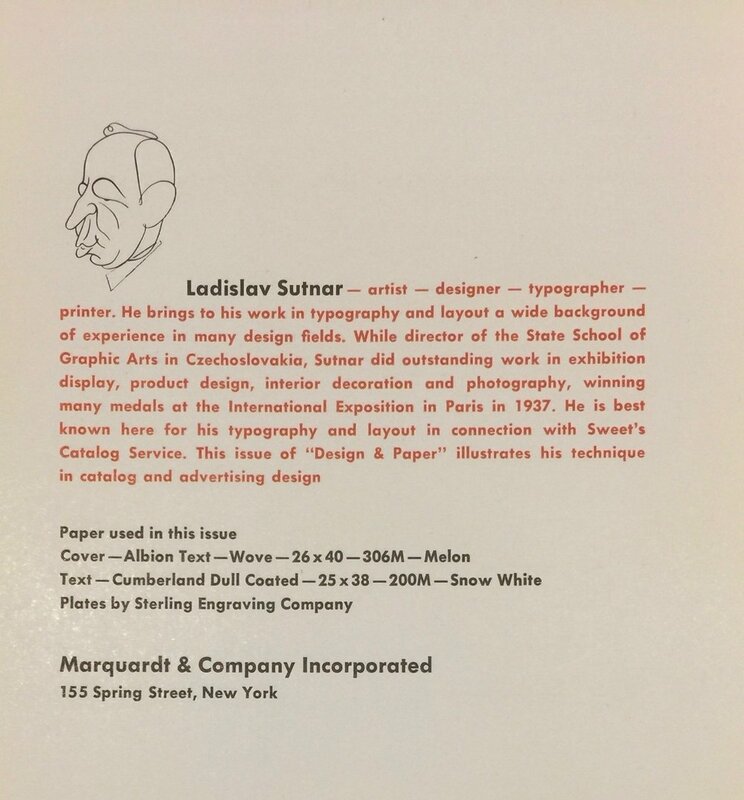 First things to catch my eye were the editions of Design and Paper, and especially this from Ladislav Sutnar about catalogue design. 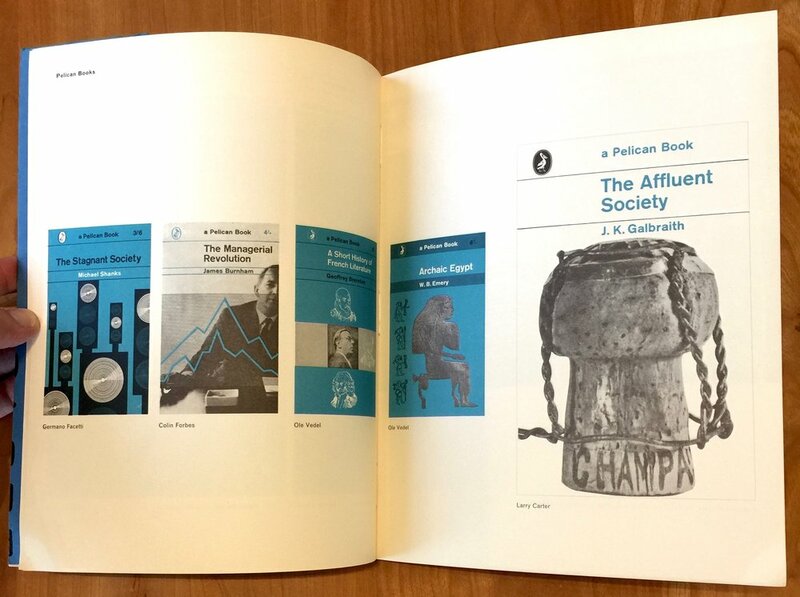 Then I spotted the visual sumptuousness of the city books from Red Fox Press. These beautiful objects are a real feast for the senses. Fantastic use of materials, combined with glorious screen printed colour make them true objects of desire. 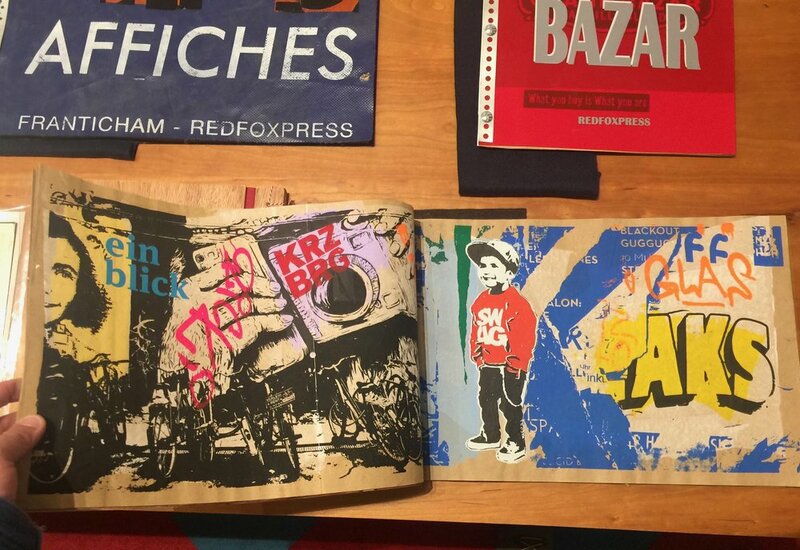 The three shown are Tokyo, Berlin and Paris and each uses a different visual vernacular from the cities as the creative approach. The Berlin book is from 2014/15 and is printed on Korean cattle feed bags by the design pair Franticham (FRANCIS VAN MAELE & ANTIC-HAM). 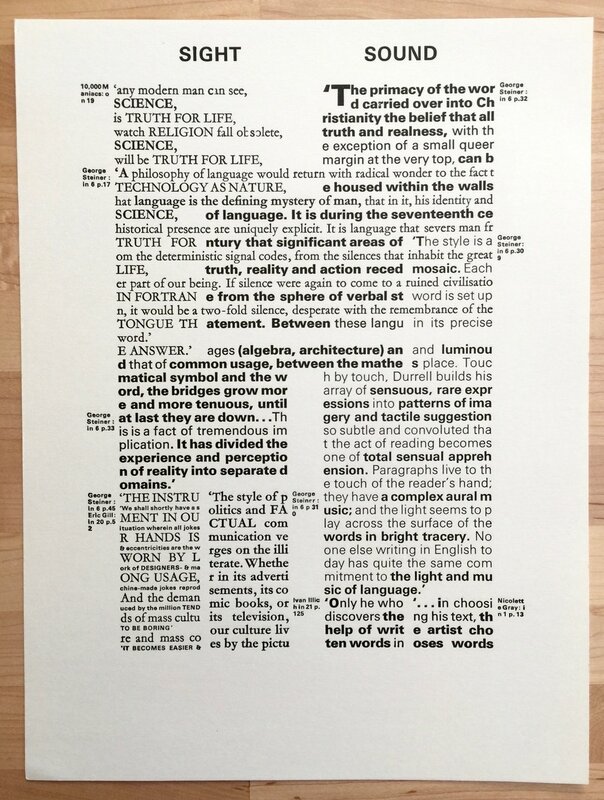 As I continued to make my way around the table I started to see more and more combinatorial design artefacts, including Queneau's Cent mille milliards de poèmes and 'the book that's could be made'— Jonathan Safran Foer's Tree of Codes as well as many other experimental formats. 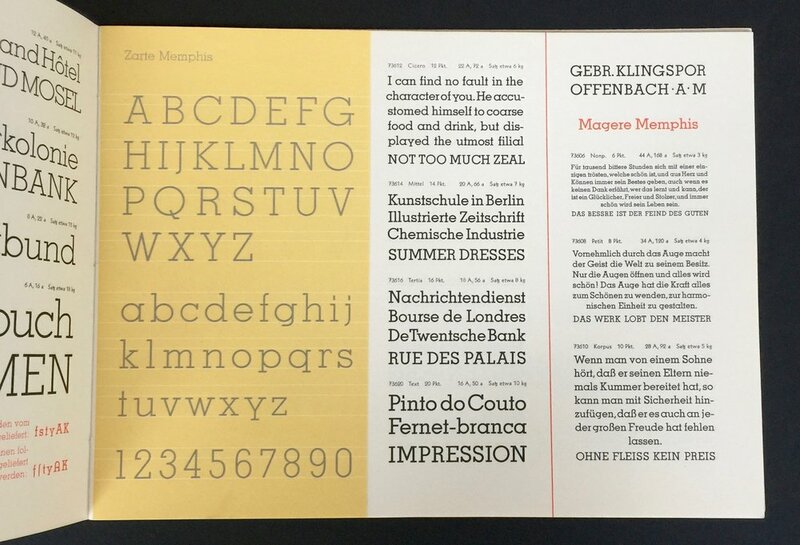 There were a few personal favourites, like the semaphore cover of Typografische Monatsblätter and this beautiful typographic deconstruction on trace. But these incredible re-imaginings of classic fairy tales by Warja Lavater from Adrien Maeght were a wonderful surprise. Each one reworks a fairy tale through illustration, half visualisation, half illustrative storytelling. These first 2 pics below are from Little Red Riding Hood and even include a legend - wonderful idea and there's a box set to boot! Wonderful way to spend the end of the day. And of course there were plenty of historical letterforms out too. 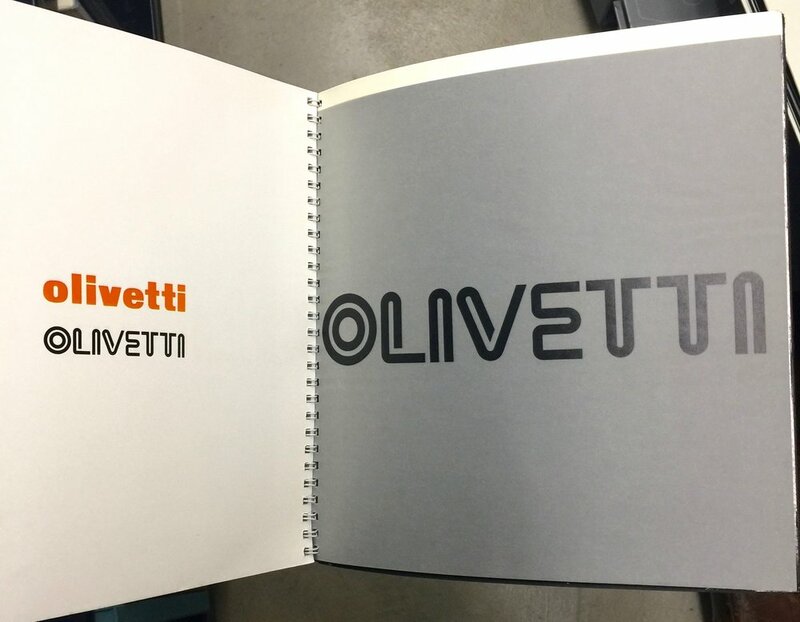 As you'd expect, the Letterform Archive has a lot of identity and brand guidelines. Many of these are not very glamorous, often simply presented in ring binders, but they are graphic design gold. 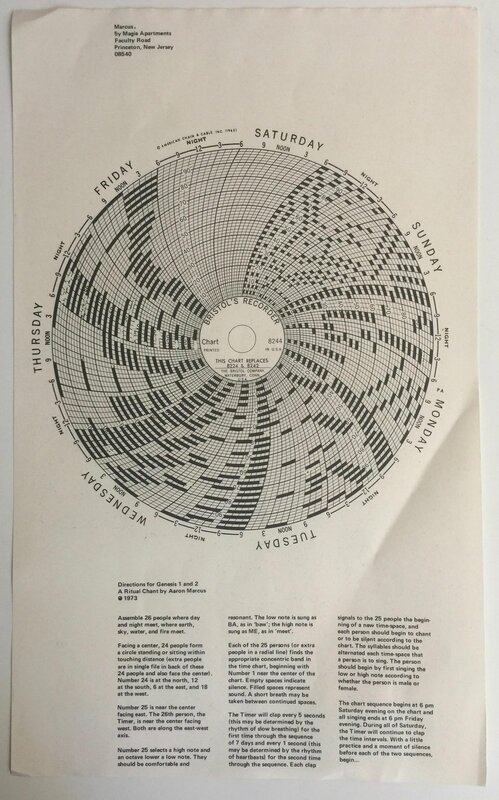 On a recent visit I spent some time cataloguing them. 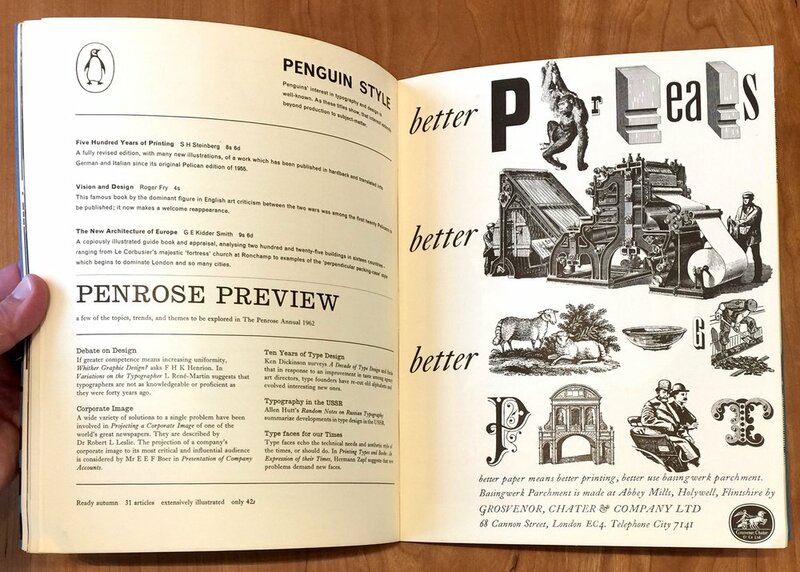 Here's a close up of Paul Rand's wonderful reference to Jan Tschichold on quality in the back of the IBM book. One of the things I love most about visiting the Letterform Archive is the impromptu discovery of awesome bits of design. You can book a research session with them and get a focussed deep dive into a particular subject area, but as a volunteer you just turn up and get stuck in. At one of my sessions Rudy VanderLans and Zuzana Licko from Emigré had just sent over a batch of posters and printed paraphernalia. 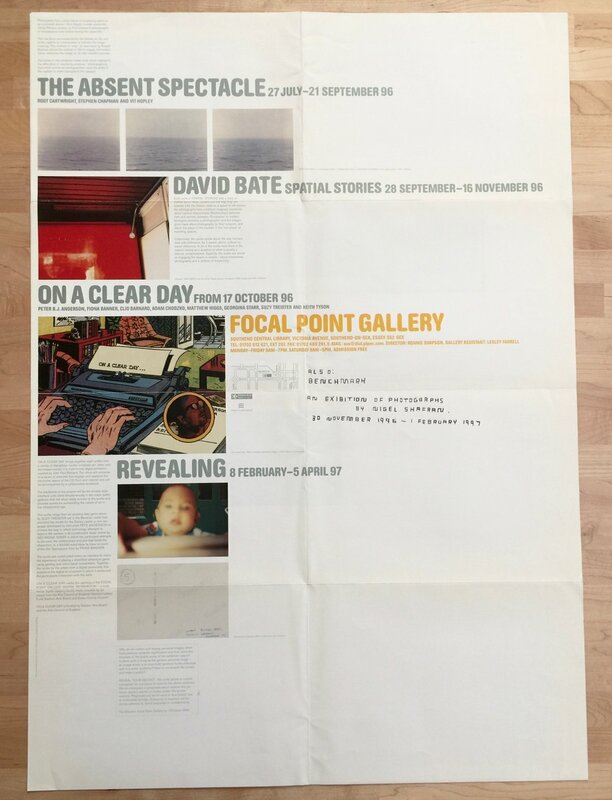 Letterform Archive already has Emigré's archive including the digital development of the type faces, but this was a stack of items that they had been sent (by the looks of it back in the '90s). It was an amazing flashback to my time at art school. 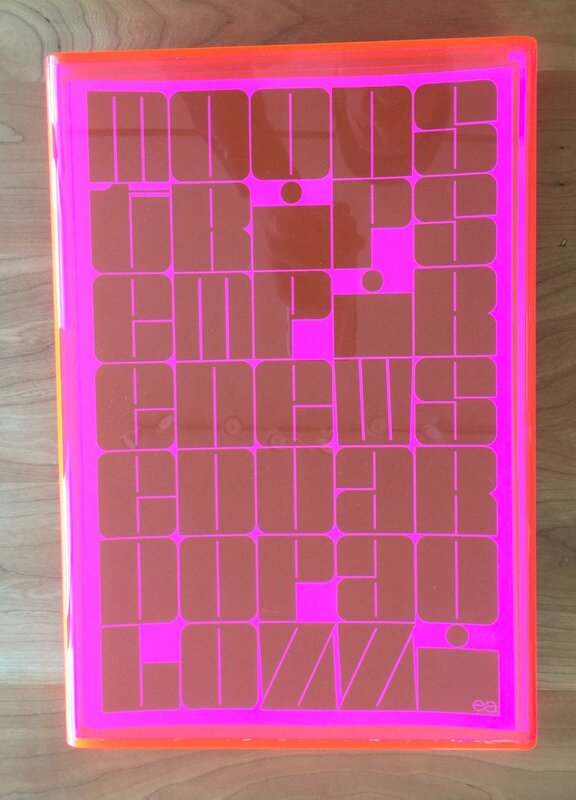 Here's a selection from the stack that includes the work of (amongst others) The Designers Republic, Phil Baines and Graphic Thought Facility. I particularly love the poster for The Residents gig in Zurich, not sure of the designer, Homer Flynn maybe? Although the eclectic nature of the archive is being filtered heavily through the things I love, it's still amazingly diverse. 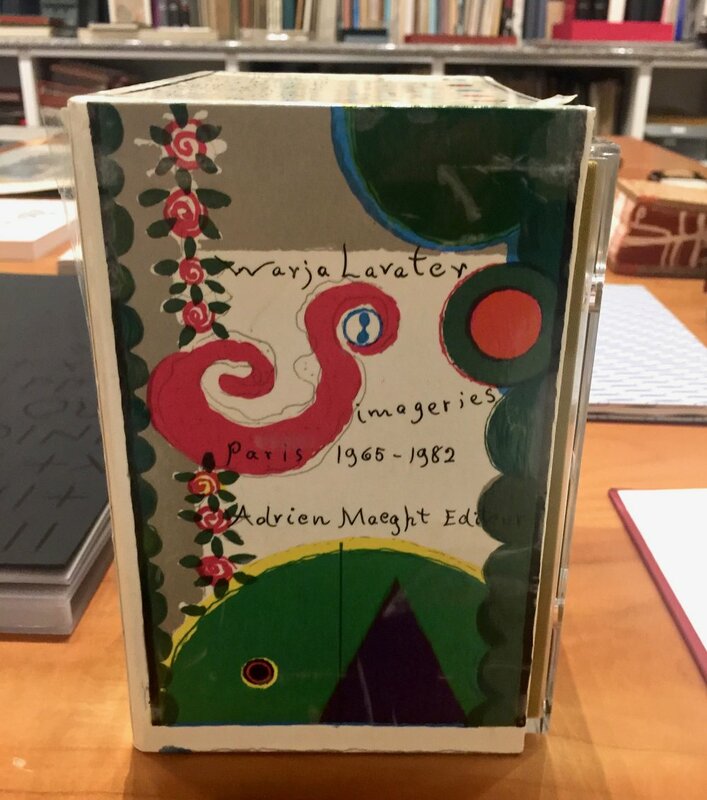 Here's a bunch of shots that include Raymond Queneau's Exercices de Style (see my copy here) and Cent Mille Milliards de Poèmes, dada letter art, type specimens and a few pics from the many, many design journals they have. And this wonderful type specimen with the annotation in pencil explaining that the ragged top is the result of mice.